TSO Products have searched far and wide to bring you the best knobs to complement their new DoubleGroove™ line of 20mm Bench Dogs. These high quality, German-made knobs are surprisingly easy to thread and, once engaged, spin with minimal resistance until cinched down—hence the term speedknobs. If you're familiar with using the knobs included with Festool's 488030 Clamping Elements, you'll find our SpeedKnobs to be much easier to use. 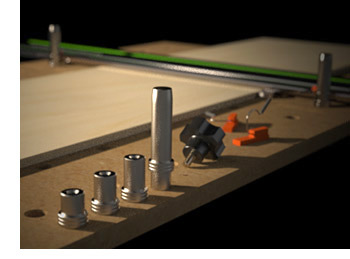 Easy to Use: Speedy to thread and speedy to clamp into your 20mm perforated worktop. A Perfect Fit: Featuring an M8 x 1.25 steel stud, SpeedKnobs will fit perfectly into your TSO DoubleGroove™ Bench Dogs and most other dogs with threaded holes. A Great Companion: SpeedKnobs™ can be used in conjunction with TSO DoubleGroove™ Bench Dogs to secure your TSO PTR-18 Precision Basic Triangle and the TSO MTR-18 Precision System Triangle to your perforated worktop.